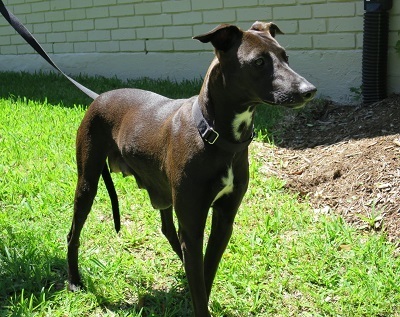 Marge is an approximately 2 year old petite black female greyhound mix. She was a stray in Tulia, and came to GALT through the shelter there with her three puppies who were born on April 17th - Bart, Lisa and Maggie. She is a good mother - providing a steady milk supply and carefully watching over her pups. Marge's DNA results came back as American Staffordshire Terrier crossed with a Mixed Breed. Judging by her long legs, we think a sighthound could have been part of her mix somewhere along the line. We think she's quite the lovable honorary greyhound!